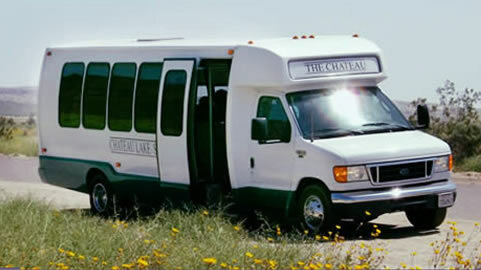 The Chateau owns a 23-seat passenger bus and one automobile which is used for general activities and may also be reserved for private transportation, subject to the availability of a driver and vehicle. Each Tuesday and Thursday, the bus leaves the Chateau entrance circle to go to Vons at 9:30 a.m. and to Albertson’s at 10:00 a.m. Pick-up is an hour later and, upon your return to the Chateau, there will be assistance carrying your groceries up to your unit. Also on Tuesdays and Thursdays, at 1:00 p.m. and 2:00 p.m., transportation is provided for errands and other non-medical appointments within a certain radius of the Chateau. Please sign up at Concierge at least 24 hours in advance and provide an exact address for your appointment. The Medical Loop: Special transportation is provided all day Monday, Wednesday mornings, and Thursday afternoons for residents with Medical appointments only. The radius is expanded to include the areas of Scripps Encinitas, the Tri-City area in Vista/Oceanside as well as the Palomar area in Escondido. Seating is limited and advance sign-up is required. Usually arranged once a month, on a Friday, at 10:00 a.m., alternating between local malls and outlets. Leaving the Chateau at 12:45 p.m., we provide transportation to both these destinations once a month. Requests for private transportation, including service to and from San Diego Airport and Cruise Ship Terminal, should be made as far as possible in advance. All private transportation is billed at the same rate without regard to the number of passengers. (See list of ancillary charges). Residents’ personal vehicles may not be driven by Chateau personnel. As of January 2010, all group transportation for Chateau residents (excluding Private Transportation) is free of charge. A nominal fee will be charged for guests. See Ancillary Fee schedule for details.